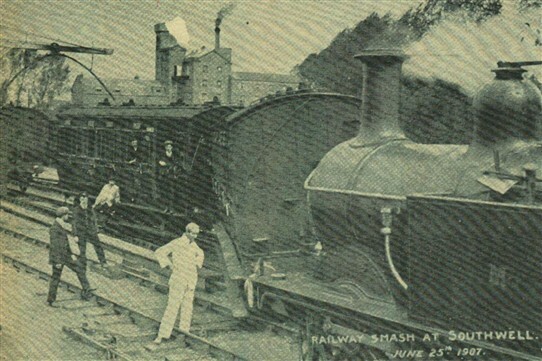 "On Tuesday morning, between eight and nine o'clock, when the train for Rolleston Junction was leaving the large shed [at Southwell station] the points were changed too rapidly, with the result that one carriage was thrown off the line, the compact causing it to telescope the compartment immediately behind it. "Happily no one was injured, and the rails were cleared during the day. "Mr. Howard Barrett secured an excellent portrait, and picture postcards of it are now on sale". This page was added by Website Administrator on 18/03/2014.